All right, the animals aren’t gonna take that anymore -- not even those gentle pokes from Simon & Garfunkel. They’re earned their rights to be short-fused, pissed off and fed up -- but not yet on human flesh. 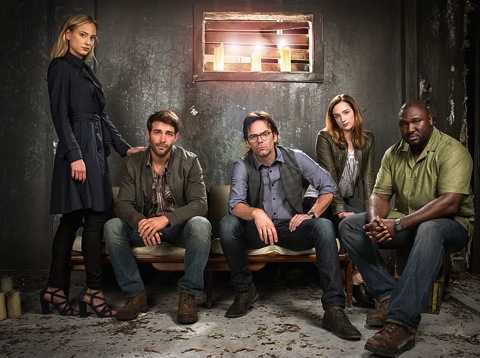 CBS’ Zoo, based on the James Patterson page-turner, gives the animal kingdom an opportunity to address all grievances in the interests of also providing summertime “popcorn” entertainment for humanoids out of harm’s reach. Those cheaply exploitative 1990s When Animals Attack! specials on Fox give way to a more handsomely produced 13-episode series whose premiere episode nonetheless could use a little more bite. CBS’ Under the Dome and Extant, respectively returning on Thursday, June 25th and Monday, July 1st, got off to stronger starts with their opening hours. But it’s how you finish that counts. So maybe Zoo will gain steam rather than start falling apart like its predecessors. It has 11 executive producers -- in reality at least six too many -- to gang-steer the course. Resilient James Wolk, the principal star, craves a long-term TV hit after the failures of Fox’s Lone Star and CBS’ The Crazy Ones. In the interim he was written in and out of Mad Men as mysterious ad man Bob Benson. Back in Los Angeles, a pair of lions have staged a jail break and left three humans dead and five wounded. But there’s more. What if even kitties banded together and formed a street gang? On a personal note, our normally super-purry cat Snickers went nuts the other night when a feline drifter popped up outside a front window. So anything’s possible, even if the kitties of Zoo appear to have human prey in mind. The two-legged L.A. contingent is headed by newspaper reporter Jamie Campbell (Kristen Connolly), whose boss finds out she’s secretly blogging as the crusading “Girl with the Genie Tattoo.” This is not good, particularly because the Los Angeles Telegraph is beholden to a conglomerate owner with holdings that include a sinister agro-chemical company with a new contract to feed L.A.’s zoo-confined animals crappy, pesticide-laced food. Jamie has been on the attack with her blog, wondering if the lions in particular are now retaliating. This gets her fired and leads to an alliance with Mitch Morgan (Revolution refugee Billy Burke), an off-beat veterinarian who’s grown disgusted with the human rat race. Expect other sparks to fly between Jamie and Mitch in future episodes of Zoo. Wolk’s Oz also gets a potential love mate in Chloe Tousignant (Nora Arnezeder). In Patterson’s book she was an ecologist. In the CBS adaptation, Chloe is a Parisian on a “honeymoon” safari by herself after being jilted by a philandering fiancé. Wandering in the bush after lions attacked her camp, she’s rescued by Oz and encouraged to drink a few shots of calming Kentucky bourbon. C’est manifique. As for Abraham, he’s seemingly done in by lions just before Oz manages to drive off with Chloe after they’ve also been under attack. But the actor who plays Abraham is listed among the five series regulars, so take his “death” under advisement. Zoo very much spares the gore in its less than scintillating but better than lackluster opening hour. Other than a briefly seen rhino hunter, there are no real villains for the animals to vent their furies on. But an evil corporate mercenary could always be injected at any moment. Don’t expect anything in the vicinity of the special effects thrills of Jurassic World, where dinosaurs devouring terrified humans is still a very popular spectator sport. Zoo’s up-close shots of lions growling is about as good as it gets in the lone episode made available for review. But plenty of possibilities exist, including rampaging giraffes, bloodthirsty macaws and even revenge-bent koala bears. So let the fur and the feathers fly -- maybe with even a little extra firepower when needed from Saturday Night Live’s laser cats.